The beverage packaging market was valued at USD 111.36 billion in 2017, and is expected to reach a value of USD 142.28 billion by 2023 at a CAGR of 4.17%, over the forecast period (2018-2023). The increasing importance of preserving the quality of the content has made effective packaging a necessity in the beverages industry. Growing demand for extended shelf life has directed beverage manufacturers to emphasize on developing sustainable and durable packaging solutions, which can essentially reduce the storage cost, and complement the global beverage packaging market further. A prospering beverage industry in emerging markets, such as Brazil, India, and China, buoyed by the presence of a large consumer base, is expected to drive the beverage packaging market, over the forecast period. However, the market is anticipated to be challenged by stringent environmental norms associated with the use of plastics and its additives, in packaging. Choosing plastic over glass is a viable option for manufacturers to reduce weight, speed up transportation, and reduce packaging costs. 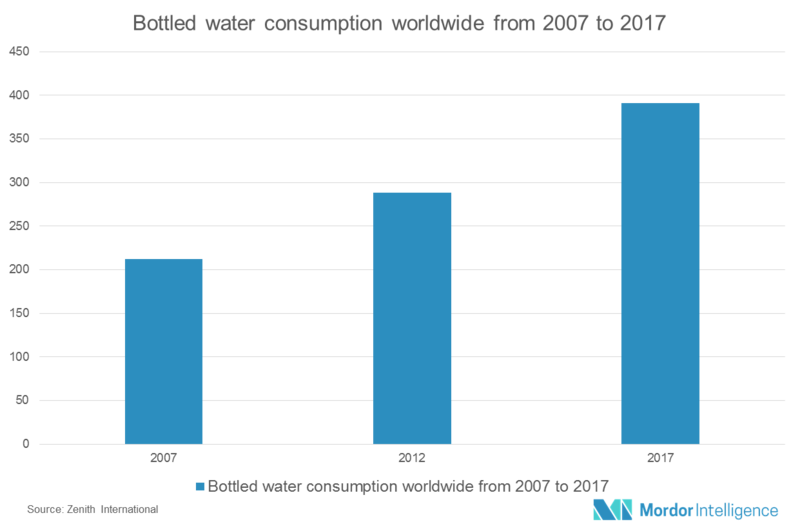 The use of plastic for beverage packaging is expected to reduce drastically, owing to stringent natural standards related to the use of plastics in packaging. The beverage packaging market in APAC will continue to witness a robust growth over the forecast period. The region will keep on offering opportunities to existing and new competitors, as the beverage industry will witness a huge demand by volume. The beverage industry encompasses drinks, primarily ready-to-drink alcoholic and non-alcoholic beverages. The industry is witnessing a strong growth due to evolving efficient distribution and packaging mechanism, introduction of new innovative products, and increased consumption frequency and trials, achieved with persuasion from traditional advertising and digital media. The market is witnessing new segments, like energy and sports drinks, vitamin water, flavored water, flavored tea and coffee, and vegetable juices, over the years. These new segments are helping to grow the market further, by providing more variants that lead to an increase in consumption. Milk, aerated drinks, alcoholic beverages, and juices are the traditional categories that have well defined consumption, while the new segments, like sports and energy drinks and vitamin water, offer targeted proposition and benefit for specific consumption. The distribution systems are evolving, leading to deeper market penetration in a cost-effective way. Installation of automated vending machines, development in robotics, process automation, franchising, and licensing are helping this volume-driven market to attain high volumes, and overall profitability and growth. The plastic beverage packaging segment is anticipated to grow at a healthy rate, owing to several factors, such as the high growth of end-user applications, dynamically changing lifestyles, availability of feedstock, and increasing emphasis on manufacturing innovative designs. Plastic bottles are becoming more pervasive because of their advantages over glass bottles. Choosing plastic over glass is an easy decision for manufacturers who are looking to reduce weight, speed up transportation, and reduce packaging costs. Polyethylene terephthalate (PET) bottles are expected to witness steady demand from end-use sectors during the forecast period. The Asia-Pacific region holds a significant potential for development, in terms of the most prospective countries. The market holds major share in retail packaging, estimating to nearly 75%, as major manufacturing is done in China. The demand for beverages, and hence the demand for beverage packaging, is expected to grow faster in the Asia-Pacific region, due to a rise in income and ongoing population shift from rural to urban, in major countries such as China, Japan, and India. Change in lifestyle and a growing young population lead to a higher demand for branded and packaged substances. At the same time, growing health awareness and more concern towards environmental sustainability, lead to innovations in beverages packaging in the region. Major Players: Amcor Limited, Bemis Company, Inc., Mondi PLC, Tetra Laval International SA, RPC Group PLC, Alcoa Inc., Westpack, Rexam Inc., Reynolds Group Holdings, Sonoco Products Company, Crown Holdings Incorporated, and Ardagh Group. September 2017 – Bemis entered into partnership with Dow Packaging and Specialty Plastics and Ploykar Inc., to recycle plastic scrap. February 2017 – Mondi group acquired Excelsior technologies for USD 40 million. This acquisition is expected to expand its consumer packaging business. November 2016 - Amcor acquired the North American rigid plastics blow molding operations of Sonoco Products Company, a global packaging company based in the United States.